The eighth season of Doctor Who featured the return of the Autons, first seen in Season Seven's Spearhead from Space. It also introduced Jo Grant (Katy Manning) as The Doctor's new assistant, replacing Liz Shaw (Caroline John) who was mentioned as having left for Cambridge. 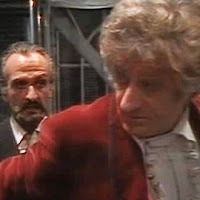 Also introduced, or maybe re-introduced, was The Master (Roger Delgado), a renegade Time Lord. I'm kinda thinking The Master might be the same Time Lord as The War Chief from Season Six's The War Games, but some research says it's a different Time Lord. If that's the case, that's now three renegade Time Lords: The Doctor, The War Chief, and The Master. Oh, wait. I forgot about the Monk from Seasons Two and Three. That's four renegade Time Lords. Somebody needs to get a handle on the Time Lords. During each of the five serials (25 episodes), The Doctor battled The Master. The Doctor did finally leave present-day Earth in Colony in Space (6 episodes) when the Time Lords sent the TARDIS, with The Doctor and Jo on board, to some far off planet 500 years in the future. It seems The Master stole the plans to some doomsday weapon, so the exile is temporarily lifted, and The Doctor and Jo wind up on some planet being colonized by Earthmen in 2472. That was the only off-Earth serial in the season. It's also the most left-leaning episode, since it was written by communist Malcolm Hulke. Season Five is the first season to have all episodes available on Hulu. Of the first seven seasons, only Season Four and Season Five have no episodes available on Hulu. While Amazon Instant Video (and Amazon Prime) has one serial each from Seasons One, Five, Six, and Seven, there are none from Eight. While the season was okay, there was nothing particularly outstanding abut the season. Yes, the introduction of The Master brought a major villain to the show, but if he's not another incarnation of The War Chief, then he's simply another version of a renegade Time Lord. The serial The Dæmons (5 episodes) featured a community covered by an invisible impenetrable dome. I think they must have stolen the idea from Stephen King. Yes, I know Stephen King published Under the Dome in 2009, but he it's a rewrite of an unfinished story from 1972. It's obvious The Doctor took the TARDIS forward in time from 1971 (when this episode first aired) and stole the idea from King. He should sue. That serial also featured a community dance. A lot of townsfolk were dancing in the street, then grabbed The Doctor and tied him to a Maypole. It seemed like something straight out of The Prisoner. The season-long arc of battling The Master certainly made for a different style of show, and I do miss the leaping about the galaxy and across the barriers of time. But, once The Doctor gets the TARDIS back fully functional and returns to galavanting across the universe, that'll be the end of Bessie. Though at first I wasn't a fan, I've come to like the little yellow car. I think I want one. I think Gallifrey University's graduate program needs to do a better job of vetting its pupils. Both The Doctor and The Master are running around causing havoc. Can you imagine the damage The Dentist could do? Or how about The Lawyer? Originally, the Monk, War Chief and Master were identified as three different incarnations of the same Time Lord. Interviews, promo material, Target novelisations etc. all confirm that it's the same Time Lord. However, in the 1990's Peter Darvill-Evans' Virgin novels pushed the idea that they're three different Time Lords. Only authors who subscribed to this idea got stories published, and Darvill-Evans as editor sometimes even inserted "references" into stories. But then, subsequent stories simply ignored the Virgin continuity. And RTD's Master(Jacobi and Simm) has continuity references to the Monk/War Chief by the bucketload. But then under Moffat's watch Big Finish brought back 'The Monk', contradicting pretty much everything that has gone before. While the history of 'The Monk' is now hideously convoluted and more contradictory than the history of the Simpsons family tree, there is actually nothing at all anywhere that states that the War Chief and the Master are not the same individual. The sole piece of "evidence" is a laughably bad sequence in the 'Divided Loyalties' novel which is actually called "DREAMING". And none other than the Celestial Toymaker later takes credit for inserting this false nightmare into the Doctor's mind. Meaning, it's not a literal depiction of events, but rather a sick game.